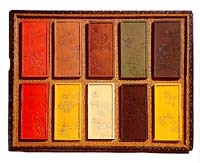 These ten different-colored inkcakes are rectangular in shape, with raised edges. The colors are vermilion, pink, yellow, pale yellow, blue, white, black, green, mauve. and pale mauve. One face of each cake bears a poem by the Ch'ien-lung emperor, "Singing of Flowers," inscribed in gold. 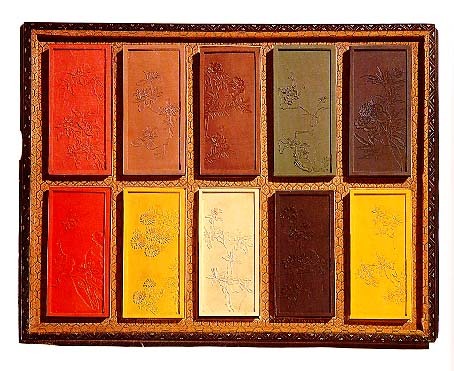 On the other side, each inkcake has a different design of flowers. There is a Ch'ien4ung reign-mark in relief on the left edge of each inkcake.